Today: Cloudy skies during the morning hours followed by thunderstorms in the afternoon. High 82F. Winds SSW at 10 to 15 mph. Chance of rain 80%. Tonight: Thunderstorms in the evening will give way to partly cloudy skies overnight. Low 64F. Winds light and variable. Chance of rain 80%. Extended ForecastMonday: Partly cloudy early followed by increasing clouds with showers developing later in the day. High near 75F. Winds light and variable. Chance of rain 50%. 2 Serving the communities south of Lake Okeechobee May 27, 2010 SUPPORT LOCAL ECONOMY SUPPORT LOCAL ECONOMY New Furniture For Less! INSTANT FREE DELIVERYHighpoint Furniture2346 U.S. 27 North, Sebring, Fl 863-382-0600C Gbt Dr. Zynab HassanBoard Certied by the American Board of Family PhysiciansPediatrics Womens Health Family Physician Monday Thursday: 8:00am 5:00pmFriday : 8:00am 4:00pm(863) 467-2159RaulersonPrimaryCare.com 202 NE 2nd Avenue, Suites 3 & 4 Okeechobee, FL 34972 Hablamos Espaol Same Day Appointments Afliated with Raulerson Hospital Always on Top of the JobRe-Roofing Specialists Metal & Shingle Roofs Flats & Leaks Repair FREE ESTIMATES863-357-3838State Lic.#CCC1327338 2 Okeechobee News December 29, 2013 Okeechobee Forecast Special to the Okeechobee NewsSharp Shooters take aimThe Okeechobee 4-H Sharp Shooters Club had beautiful weather for the December shoot and Christmas party at the Okeechobee Sheriffs Of ce Gun Range. The club practiced archery and ri e target shooting. For more information on Sharp Shooters and other 4-H Clubs, contact the Okeechobee County Extension Of ce at 863-763-6469. 2 Serving the communities south of Lake Okeechobee May 27, 2010 2014 meeting schedule announced for the St. Johns River Water Management Districts Governing BoardMeetings of the Governing Board of the St. Johns River Water Management District are open to the public for input in the governance process. As required by Florida law (189.417 Florida Statutes), this notice is given so that the public has an opportunity to attend meetings that may be of interest. Governing Board meetings are held at District Headquarters, 4049 Reid Street (Hwy. 100 west), Palatka, Fla. Date, time and location are subject to change at the discretion of the Governing Board. For additional information about the District, its Board and meeting dates, visit www.floridaswater. com. Meetings for 2014 are currently held upon conclusion of the 10:00 a.m. Regulatory Committee Meeting and scheduled as follows:YEAR 2014 MONTHDATE JANUARY14 FEBRUARY11 MARCH11 APRIL8 MAY13 JUNE10 JULY8 AUGUST12 SEPTEMBER9 SEPTEMBER23 (final budget hearing 5:05pm)OCTOBER14 NOVEMBER12 DECEMBER9 561.747.1232 Monday Evening Hours Now Available! Face Li Tummy Tuck Breast Augmentation Breast Li/Reduction Endoscopic Brow Li Nasal Surgery Eyelid Surgery Liposculpture Botox and Fillers SPRING LAKE GOLF RESORTDec. and Jan. Rates Cougar Trail and Panther Creek Golf Courses 18 Holes Specials Include Tax & Cart! For Tee Times Call 863-655-0101Highway 98 30 mi N of Okeechobee$2800Before 11:00am$2400After 11:00am$88004somes anytime Residential Commercial FREE EstimatesRoofing with the name you trust!Licensed and Insured St. Lic. CCC046939Dont make a Mistake! Call Big Lake 863-763-ROOF (7663) & REPAIRSROOFING 5 Okeechobee News December 29, 2013 Mr. Corona got involved as a volunteer w ith the American Cancer Society driving people to appointments, and attending a support group at Big Lake Cancer Center. He realized many of those who have the disease have little or no support. He said he wanted to help in even a small way. Its amazing how many people in Okeechobee need help. Being a cancer patient was easy for me, but it was tough on my family and care givers. I want to help them so they can help their patients, he added. He said 100 percent of the proceeds from this event will stay in Okeechobee to help families and care givers. He got a lot of local support and also support from several corporations in Dade County. Corona owns the Corona Ranch on Micco Bluff Road in Basinger. He has lived in Okeechobee since the early 1970s. His ranch will provide some of the stock needed for the event. Other stock will come from Okeechobee ranches and from the Silver Spurs Rodeo in Kissimmee. Most of the performers in the events, bronc riding and bull riding, will also be from Okeechobee County and the surrounding area. I hope to get about 1,000 people there for the rst event. It is a non-pro t event and we really hope to make a difference for care givers and families, he added. He said close to 20 cowboys will compete in each event Wednesday. The tickets cost $5 for adults and children under 12 get in free. The Future Farmers of America and Jr. Cattlemen of Okeechobee will sell barbecue dinners and the proceeds will also help cancer patients and their supporters. Even $500 to $1,000 can go a long way for these folks. There is a lot of stress and worries about bills and payment for cancer patients. You must be stress free and have a good state of mind if you are to beat this disease, he added. Mr. Corona said he wouldnt have been able to beat this disease without help. He said many Okeechobee churches prayed for him and his family and he wont ever forget those blessings. Okeechobee is a beautiful and wonderful place to live. I want to share the blessings I have had with those that need it, he added. For more information on the event you can call 863-634-3971 or go online to www. RideForTheFight.com. RIDEContinued From Page 1 March 2014. Part of the problem is lack of speci c instructions on how to evaluate teachers. State law provides only a frame work and districts have a great deal of leeway when they determine whether a teacher is highly effective, effective, needs improvement or unsatisfactory. The current evaluation system is under review by state and federal courts in litigations brought by various teacher groups. The state average was 32.3 percent as highly effective and 65.6 percent as effective. This brings up the question many parents might ask. If Okeechobee has so many effective teachers, why is Okeechobee Schools a D district under state guidelines for 20122013? Part of the reason is the evolving system of grading, and an increase in the rigor of these tests. Assistant Superintendent of Schools Joni Ard said the evaluation results were not a surprise to the district as they obtain the evaluation data before it is submitted to the state. She explained that the evaluation system in the state is extremely complicated and is something that is determined by each district. Each district has worked and negotiated or has devised its own plan. The evaluation is something that is evolving, she added. Ms. Ard said in the past many teachers were able to have a portion of their evaluation based on school wide scores. Teachers now will be evaluated on students they actually serve. She admits she is interested to see how these numbers settle in the future. The negotiation of this is very dif cult because we must come to an agreement on the assessment we will use, the cut scores and what scores will be used to indicate success, but I anticipate there will be differences in each category in the future with a different set of students used to calculate that portion of their evaluation. In Okeechobee County, 60 percent of the teachers grade has been based on performance in the classroom. Administrators go into the classroom, look at what teachers are doing and give them evaluations based on those observances. Many teachers are doing the right thing. Some students in Okeechobee are behind the 8-ball. A large percentage of students are in the low socio-economic area and sometimes those students do not have the support that other students have. Teachers are working hard and doing really good things in the classroom, she said. Ms. Ard admits the test scores havent indicated the hard work that teachers have done but that progress is being made. She noted the district does well in the performance and improvement of low-performing students and that shows schools are doing the right thing. TEACHERSContinued From Page 1 Special to the Okeechobee NewsKiwanis speakerMike Peppers (right) is the founder and director of Okeechobees DC (Disciples of Christ) Ranch, a ministry for men ages 18-25 that have life controlling problems. He spoke to the Kiwanis Club during a recent meeting. Mr. Peppers runs the ranch on 38 acres just north of Okeechobee in Bassinger. The goal of the ranch is to help young men with the transition to becoming men. The process includes ministry and developing a strong work ethic. Work on the ranch is a vital part of the development during the program. DC Ranch runs a sawmill operation, landscaping business and various odd jobs. Kiwanian Frank DeCarlo introduced the speaker. By Okeechobee Main StreetSpecial to the Okeechobee News Okeechobee Main Street believes the year 2013 will be remembered for some of our parade and window decorating contestants as one of the best. The Christmas parade that w as on Saturday, Dec. 7, was full of holiday spirit and had the whole community coming together to celebrate what has become one of Okeechobees most acclaimed festivities for the holidays. Our judges Okeechobee Main Street board members: Maureen Burroughs, Brigette Waldau and Angie Grif n w ith great dif culty chose these participants as winners of our Christmas parade. The Best of Show: Flower Petals was stellar with their Cat in the Hat theme. Best Parade Theme: Washington County School and HBI joined forces to make the theme of Island of Mis t Toys come to life. The Best Religious Float: Sacred Heart Catholic Church, Best Traditional Holiday Float: Pemayetv Emahakv Charter School made us remember the true meaning of Christmas. Most Spirited Float: North Elementary came with a holiday cheer not to be beaten! Best Use of Lights: Yearling Middle School was not to be outdone as they were given this award for their creativity. Most Spirited Non Float went to Okeechobee Xplosion All Stars. Most Creative went to the Chobee Steelers in their beautiful golden wings. Thanks is given to all of the participants for making another unforgettable Christmas tradition a reality and thank you to our great emcee, JD Mixon, for his spirited introductions of all the entries. We would also like to thank the city, city police and sheriffs ofce for their assistance in making this event a success. Christmas takes center stage with so many of our local businesses. 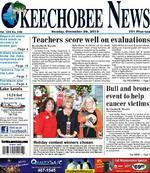 Okeechobee Main Street would like to recognize the winners of 2013s Holiday W indow Decorating Contest. Best of Show Window Display was awarded to Tonis Chic Boutique who says that the award will remain with the Boutique as they are going to outshine the competition next year. The Best Small Window Display was proudly won by 14K Gold Jewelry who stated that they looked forward to the holidays each year and were happy to be a part of the festivities. The Best Artistic Window went to the Ceeco family for their creativity and themed w indow that best re ected the theme Island of Mis t Toys. A big holiday thank you goes to the whole community that helped make this holiday season a time of warmth and friendship. We like to send a special thanks to all of our supporters including our corporate sponsors: Bank of America, Big Lake Cancer Center, OneBlood, Okeechobee the Magazine, Raulerson Hospital, Seacoast National Bank, Syfrett Feed Co., TD Bank, Walpole Inc. and VA Primary Care Outpatient Clinic. We will look forward to next year and wish everyone a happy and healthy new year! 2 Serving the communities south of Lake Okeechobee May 27, 2010 10, 9, 8, 7, 6, 5, 4, 3, 2, 1.Hoppin John! WISHING YOU A Happy and Delicious New Year!Enjoying black-eyed peas and rice for luck in the coming year is a tradition passed down through generations. When making your plans to ring in the New Year, youll nd everything you need to prepare the dishes that have a special meaning to you, your family, and community at Publix. 8 Okeechobee News December 29, 2013 2013 Christmas parade and window display w inners announced Special to the Okeechobee NewsThe Best of Show Window Display award went to Tonis Chic Boutique). Pictured are Toni Doyle (left), owner/ operator and Maureen Burroughs.